As I will be traveling this Thanksgiving, I have prepared a few posts from travel at this time last year. 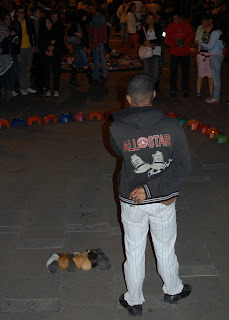 Last year's Black Friday coincided with an enjoyable street party in Bogota. This barker with the pinstriped fancy-pants is hard at work attracting bystanders to his guinea pig race. The row of timid guinea pigs know exactly what to do to when commanded, and they diligently scurry over to the numbered homes. Bets are placed, and the furry performers have a remarkable ability to find hutches with no stakes on them.